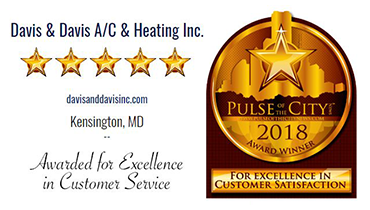 Davis & Davis provides HVAC service calls and installation throughout Montgomery County MD including: Chevy Chase Maryland, Ashton, Aspen Hill, Bethesda, Brookeville, Burtonsville MD, Kensington Maryland, Leisure World, Montgomery Village, Potomac MD, Rockville, Wheaton Maryland, Silver Spring, Takoma Park MD and Olney MD. Products and services include heat pump installation, heat pump repair, service contracts, new furnace installation, central heating systems, central cooling systems, natural gas or electric, energy efficient systems, air conditioning repair or replacement, central dehumidifiers, whole house humidifiers, programmable thermostats, emergency and weekend service calls, zoned comfort control systems, whole home air cleaners, hot water heaters and more. For years, Dennis from Davis & Davis has been inspecting my air conditioner and gas furnace. He warned me that the furnace was aging and may need to be replaced some time in the very-near future. The very-near future arrived several weeks ago. Today, I have a new a.c.unit and furnace thanks to Michael and 2 gentlemen who worked with him. Great team of technicians!